Mighty as they may be glaciers are ephemeral features. The Gorner Glacier has had a rough time of things in the four decades that I have known it. It has shrunk dramatically in length and depth which, for a student of its works like myself, is tragic. Some glaciologists believe Alpine glaciers today are a relic of the Little Ice Age from the seventeenth to early ninteenth centuries. One of the things we shall observe on our walks is evidence of glacial advances in the ice ages of earlier centuries and millenia. And I shall show you photographs and other evidence to illustrate how much bigger the glaciers were even 20 to 40 years ago. 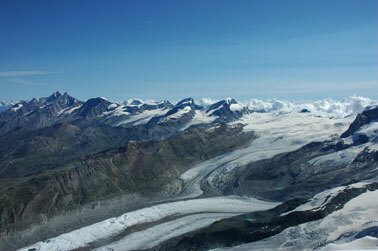 Geologically speaking it is not so long ago that Zermatt itself was buried deep under ice. Some of the glacier gorges are stunning and you will have the opportunity to examine exquisite rock features carved by ice and water when they were still under the glaciers.